Crafty criminals have used technology to streamline their operations since the word "hacking" only meant to slash off someone's limb. Recently, their methods have been getting trickier and less obtrusive, so much so that you may be robbed without even knowing about it. Who needs to be a stickup artist when a simple, slim ATM skimmer can do all the work for you? According to gizmodo.com, that's what's troubling police in southern Europe this week, after this insidious little interloper was pulled from a bank machine. It's efficient, but sure doesn't look as badass as old bank robbers used to. Powered by a mere watch battery and a small magnetic reader, the heist device was also equipped with a small data storage unit. 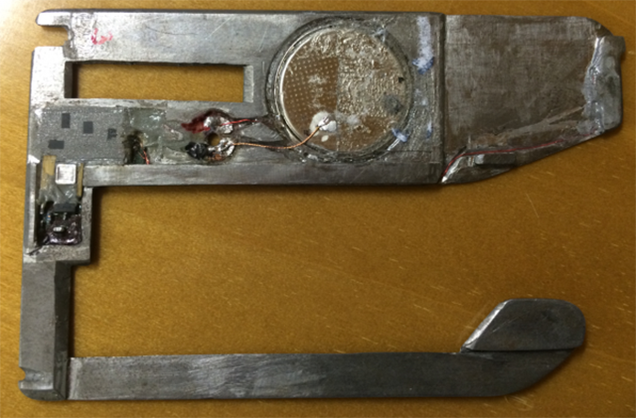 The skimmer was likely used alongside an external camera that monitored customers pressing PIN numbers, although this was missing from the crime scene. One bank employee explained that mystery well, stating they "didn't capture any hidden camera [because the criminals] probably took it. There were definitely no PIN pad [overlays]. In all skimming cases lately we see through the videos that fraudsters capture the PIN through [hidden] cameras." This trend could easily go unnoticed in busy commercial centers where people need cash quickly, but if you aren't paying attention, you may end up paying through the nose. Keep your eyes peeled and your wallets sealed around shady ATMs!